shelly's summary: February 14, 2012: Happy Valentine's Day!!!! February 14, 2012: Happy Valentine's Day!!!! a peace shirt and jewelery!!! 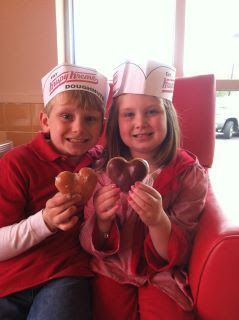 After I picked them up I took them to Krispy Kreme for a special valentine snack! However, Poor Brylee look one bite of her donut and said it did not taste good... so we could not let that baby go to waste... so I ate it! :) and I took her to mickey dee's and got her some chicken bites!!! We enjoyed a low key valentines night at home and enjoyed some delicious baked ziti, bread, salad and brownies and i did not even have to cook it... take them a meal rocks!!!! Hope you and your had a Happy Valentine's Day!!!! Full of lots of LOVE!!!!! !